My Son was once the spiritual center of the Kingdom of Champa that occupied what is now the central area of Vietnam for over a thousand years. 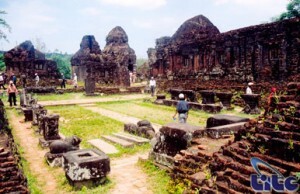 The My Son Sanctuary complex of religious monuments originally comprised of more than 70 structures of which 25 remain in varying degrees of ruins. The Cham people erected monumental towers on square or rectangular foundations. The process of decay has continued since, and what remains is in a poor state of repair. The site’s designation as a UNESCO World Heritage Area has reinvigorated interest in its conservation and has already attracted significant resources to that end, notably from Italy. Despite its neglected appearance, My Son is worth a visit. It is in an attractive valley usually quiet, peaceful, and very evocative. well away from any other buildings, in the mists of a wooded area. Even in their ruined state, the towers are impressive, and the scale of the endeavour makes its religious significance obvious. From Hoi An, depart for My Son, Vietnam’s most important site of the ancient kingdom of Champa, and as of 2000, a Unesco World Heritage site. My Son is considered to be Champa’s smaller counterpart to the grand cities of Southest Asia’s other Indian influenced civilizations: Angkor (Cambodia), Bagan (Malaysia)… Walking around this ancient kingdom to discover the Archaeologist of brick-stupas that was built from 4th to 10th century. Return to Hoi An for lunch, then walking around the ancient town to visit the former merchant’s houses, the 400-year-old Japanese Bridge, ancient pagodas, temples, the colourful market and shopping around. Trip ends.